﻿ November 2016 Marketing and Holiday Planning » Red Mango Marketing! The holiday season is right around the corner and your customers are primed and ready to buy. Now, here’s the real question. Are you ready? Do you have a plan for enticing people to shop with you this holiday season? Create an irresistible offer to drive customers to your store. You don’t necessarily have to provide a discount. But with the increased competition during this busy time of year, it’s important to show your value and offer a clear reason why shoppers should choose your business. Get the word out to your existing customers. Send a holiday-themed email to let your customers know what you have planned this holiday season. Save time with one our holiday email templates. Tip: Check out holiday emails from other small businesses and nonprofits here. Collect contact information from new customers. Many of your holiday shoppers will be brand new to your business. If you don’t give them a compelling reason to come back, you might not see them again. Encourage new customers to stay in touch by signing up for your email list. Connecting with them through email ensures you’ll stay fresh in their minds and they can stay up-to-date with future happenings at your store. Log in to Constant Contact to create your holiday email. Not a customer yet? Try us out for free! Sign up for a 60-day free trial. 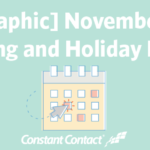 The post November 2016 Marketing and Holiday Planning appeared first on Constant Contact Blogs. This entry was posted on Monday, October 24th, 2016 at 8:45 am	and is filed under content, content ideas, Email Marketing, News & Updates. You can follow any responses to this entry through the RSS 2.0 feed. Both comments and pings are currently closed.